I’ve always loved Outback’s Blooming Onion. It’s one of those things that, ambitious as I may be in the kitchen, I’ve always been way too nervous to try myself at home. I mean perfectly batttering and frying a whole onion to crispy, golden perfection? Too far out of my league. 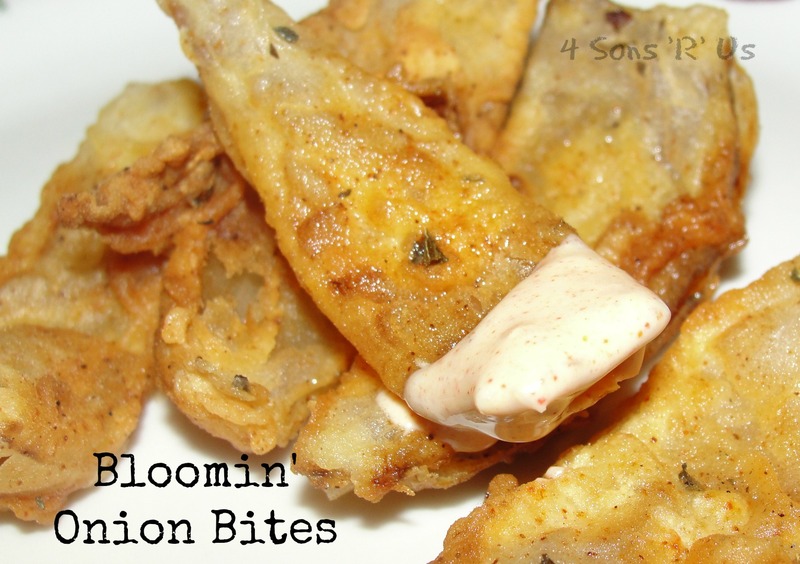 Then I saw this recipe for bite sized (totally do-able) Bloomin Onion Bites. Friggin’ genius! These breaded and fried onion bites with a spicy dipping sauce will get your party going any day! All by themselves, they’re reason enough to celebrate. Note that these do taste the best with a big sweet white onion (such as Vidalia) but if you only have regular onions on hand, that works too! Be sure to cut the wedges nice and thick. Be sure not to overcrowd your pan or fryer in order to allow all of the onion bits to get nice and crispy. 1. Combine all dip ingredients and set aside, preferably in the refrigerator. 2. Cut the onion in half and make slices down the onion to make wedges. In a bowl, toss flour and seasonings except seasoning salt. In a second bowl, whisk eggs, milk and 1/2 cup water. 4. Place on a rack while coating all of the onions. Gently tap the rack to remove excess flour before frying. 5. Heat deep fryer or a couple of inches of oil in a pan to 360-375 degrees. Place the onions into the deep fryer or oil in small batches for about 6 minutes or until browned and crispy. Be sure not to overcrowd them. Remove from oil, drain on paper towels. 6. Serve warm with chilled dipping sauce. This reminds me of onion rings, perfectly fried and a pleasure to eat. Thanks for sharing! You’re welcome guys! They’d make a fantastic snack to munch on over a few drinks with friends.